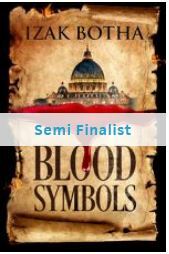 Blood Symbols has advanced to Semi Finalist in the renowned Publishers Weekly’s, Booklife Prize -2017. With 10 out of 10 scores throughout, who could have asked for more. Plot: The author provides a captivating plot that takes the reader deep into the Vatican, revealing secrets that those in power wish to remain buried. The resulting quest will keep readers on their toes until the end. Prose: This well-written novel offers the perfect balance of action, description, and character insight. Thanks to great prose, the plot unfolds at a good pace, keeping reader interest but also providing the background necessary to understand the intricate issues at play. Originality: Inevitably, all mysteries centering on this topic will be reminiscent of The DaVinci Code. Once the reader digs further, however, the story here is strikingly distinctly different and original. Character Development: The author does a superb job creating a likable protagonist in Jennifer Jaine, Other characters are equally well presented and realistic. Blurb: This fast-paced and intriguing work will hook readers from the first page to the last, leaving them wanting more.